So just like every Monday.. Berry posted her challenge up, and today it's about your favorite places. And I sat for a while. I mean.. my list is pretty boring. I either shop, or stay in a platform forever. So.. I doubted pictures of a white box would have been very interesting, besides, it's not neat AT ALL, so.. that was out of the question. But.. then I thought.. when I'm not working, I actually do stuff... other than shopping.. I roleplay! And I mean, right now there's very few places that I enjoy, all with the drama and lame people, just.. no.. You know? Like.. not even going to be going into it because I don't like to be negative, but.. whatever. There's one place in the grid however, that always has me going back to it, and that's Mischief Managed. I've talked about it a lot of times, but.. it's picturesque, and it has awesome RP stuff going on, so.. of course I would love it. Further more, there's also a new sim around the grid for Game of Thrones RP that an old friend of mine that I met in Mischief Managed brought me too, and I've been having a lot of fun there too! So.. I guess my two favorite places in the grind are.. Mischief Managed, and Crownlands! I also wanted to take a couple moments right now to speak about a couple new releases. One.. Umm.. Can we please talk about the new uniforms that Damien Fate released for his Fateplay line? It has kid mesh sizes. You know.. they fit child av's, without toddleedoo, and not only that.. they're actually well made, and mesh. I think the whole Hogwarts community in SL wept in joy when this was released. Now.. shifting. ARCADE! Arcade is upon us, and I've been lucky enough to get a couple previews, and some more that i'll share in a blog post later this week. But.. well, if you're like me, you're awaiting for the Arcade to open up while jumping up and down your chair. No, really, is okay, this release is sooo exciting. For once.. the cute adorable chipmunks of MishMish.. I mean.. words can't even describe how adorable they are! And then you have the release of Lark. Lark is new this round in the Arcade, and I couldn't be happier to see them in this line up! Like.. It's uber exciting because Sienia is an amazing talented designer that works extremely hard and her creativity is just.. extraordinary. I think the release she made for the Arcade just shows us a glimpse of not only her talent, but that amazing creativity that she possesses that sets her apart from every designer out there. 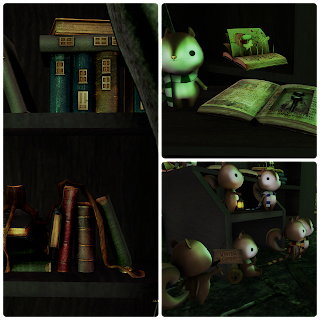 Her books and bookcase are really cleverly done, and the texturing is some of the best that I've seen in the gird in those books, and I'm not even exaggerating. I love these. So.. make sure to keep an out for her, and visit her store for other amazing stuff! Meanwhile, sit with me and glare at your pc, until it's time for you to get into the Arcade!